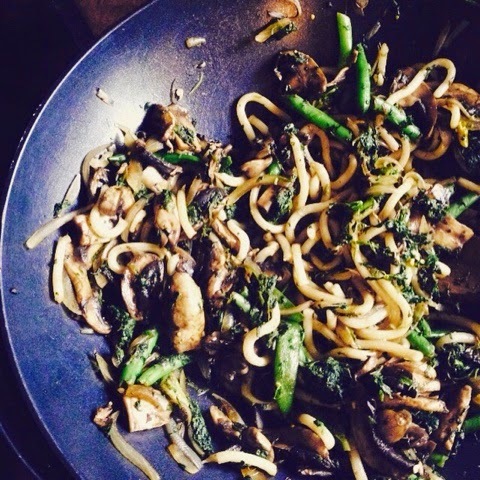 This mushroom stir-fry was one of the first vegan dinners that I ever made. When I first became in vegan (only a few months ago), I started with trepidation and enthusiasm. But it didn't take long before I started to come home and make pretty much the same meal every single night. Mushrooms (almost a kg of them) with either brown rice or toast. As much as I love mushrooms, I needed more variety to keep my interest and to provide a diverse range of vitamins and minerals. So here is a simple stir-fry that is fast and easy to make. The beauty about stir-fries is that you can change them up every single time you make them. Just use whatever vegetables you have in the fridge or freezer. I like to stop at our local vegetable market on the way home and pick up whatever is in season to add to my stir-fry. If you don't have fresh baby spinach, you can use frozen spinach. Just defrost it first and give it a good squeeze to get rid of all of the water. This particular stir-fry included mushrooms, onion, beans, spinach and udon noodles. My very strict vegan friend told me to swap udon noodles for rice noodles or brown rice. But that's because she also avoided eating any gluten. I say to eat whatever grains tickle your fancy. I used an electric wok to make my stir-fry but you could also use a fry pan if you wanted to. 1. Heat wok to medium-high heat and add sliced mushrooms. Don't stir them. Just let them sit for a few minutes then give them a stir. This reduces the amount of liquid that they release and (usually) stops it from becoming a big watery stew. If there is liquid in the wok/pan just tip it out into the sink and keep going. 2. Once mushrooms are soft and brown remove them from the pan and set aside. We will add them back in in a sec. 3. Add onions to the pan with a teaspoon of water to stop them from sticking. Also add garlic and ginger and cook onions until soft. 5. Now it's time to add the mushrooms back into the pan along with the baby spinach leaves. 6. Add lemon juice and soy sauce and give it a good stir to mix everything through. This recipe is part of a meal plan - click here to see the whole day.